Bioshock Infinite looks sweet. It's strange for me to type that because I loathed Bioshock 2 because of the shear potential that was wasted in it's creation. 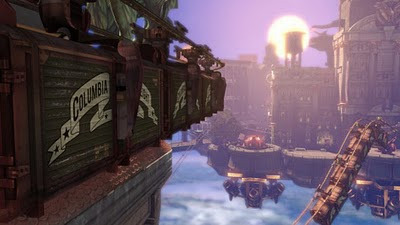 Bioshock 2 was a complete rehash of the first game without compelling advancements or changes. On the other hand, Bioshock Inifinite is absolutely the correct way to handle an intellectual property. Do you remember what I wrote about the importance of developers? Well, I just learned that Bioshock 2 had a completely different developer than the original. 2K Marin handled that game instead of the original developer, Irrational. That explains the feeling of sameness that permeated the game. Irrational is back at the helm for Bioshock Infinite and they're taking the series in a new direction. Gone is the underwater city of Rapture. Instead, Columbia is a floating city in 1912. It's an American city that has taken nationalism too far. Big daddy's are nowhere to be seen but a giant mechanical monster called "Him" is trying to keep your companion character, Elizabeth, confined to a tower where she's been trapped for the past 15 years. It's your job to get her out of Columbia. There are many similar veins to be seen in Bioshock Infinite, but it truly looks like the developer has gauged the strengths and weaknesses of Bioshock and built from there. With no reused assets and a brand new game engine it seems that Irrational wants to keep this game feeling unique. Taking the central feelings and themes of Bioshock and building an entirely new game from scratch is an amazing way to keep the series fresh. I can't even do it justice, but I'm extremely excited to see how Bioshock Infinite turns out. It just goes to show how much the developers really matter in game creation. If you haven't seen the gameplay trailer you should watch it right now.